I love my chocolate! Before I was introduced to raw food and raw desserts, if I ate a piece of chocolate I would end up finishing the packet, box, container within a short period of time. I was hooked. Afterwards I would feel yuck. I’d consumed way too much chocolate, I now had a chocolate high which meant I was going to crash sometime soon and I just felt angry at myself that I had let myself pig out on the packet. I mean who eats a whole packet of Tim Tams as they walk home from the shops or eats all the Ferrero Rocher in less than 24hours (yes the big box)? That is why I wouldn’t have chocolate in the house as I knew that if I started it would all go very quickly. Well that is not the case now. I love my raw chocolate creations. They satisfy the sweet tooth, I do not feel bloated and heavy after having it and best of all I feel satisfied after a slice and have no desire to consume it all. 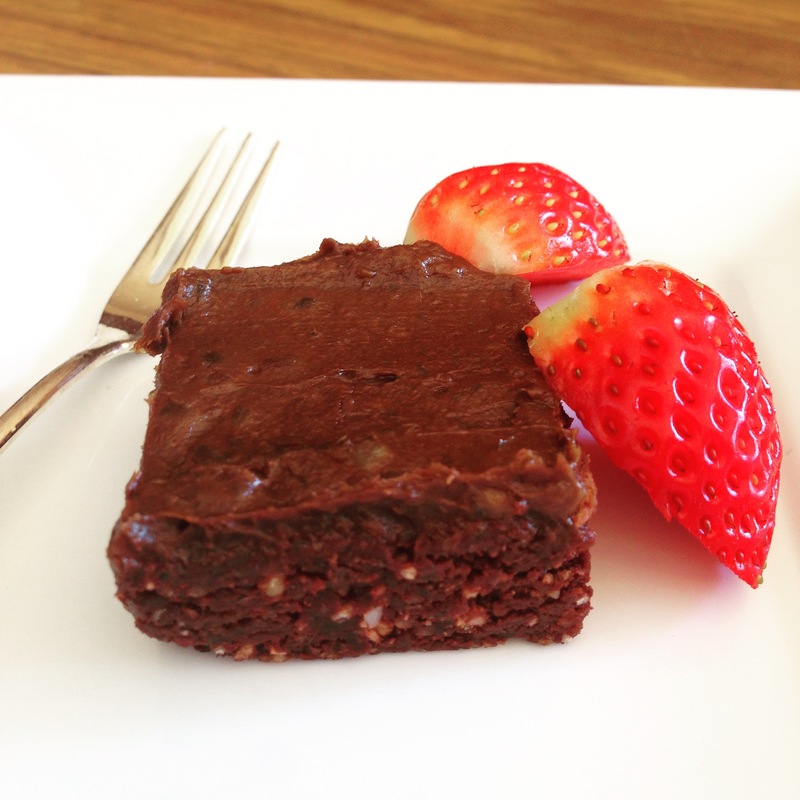 This is one of my favourite chocolate recipes as the brownie part is moist while the chocolate frosting is just to die for. Once I’ve made a batch I slice it up and store it in the freezer and then I am able to have a piece whenever I feel like it. Add medjool dates to food processor and process until dates are finely chopped through the mixture. This mixture should stick together forming a ball when you squeeze it. Press dough into 13cm x 36cm flan tin. Place in fridge while making frosting. Place all avocado, raw cacao powder, and dates into a high powered blender like a Vitamix. Blend until smooth consistency. Add coconut oil and blend again. Mixture should be spreadable and not too runny. If needed, add 1tsp of the date soaking water, at a time to the blender and process again. Smooth the frosting over the brownie mixture and place back int eh fridge for 30 mins. 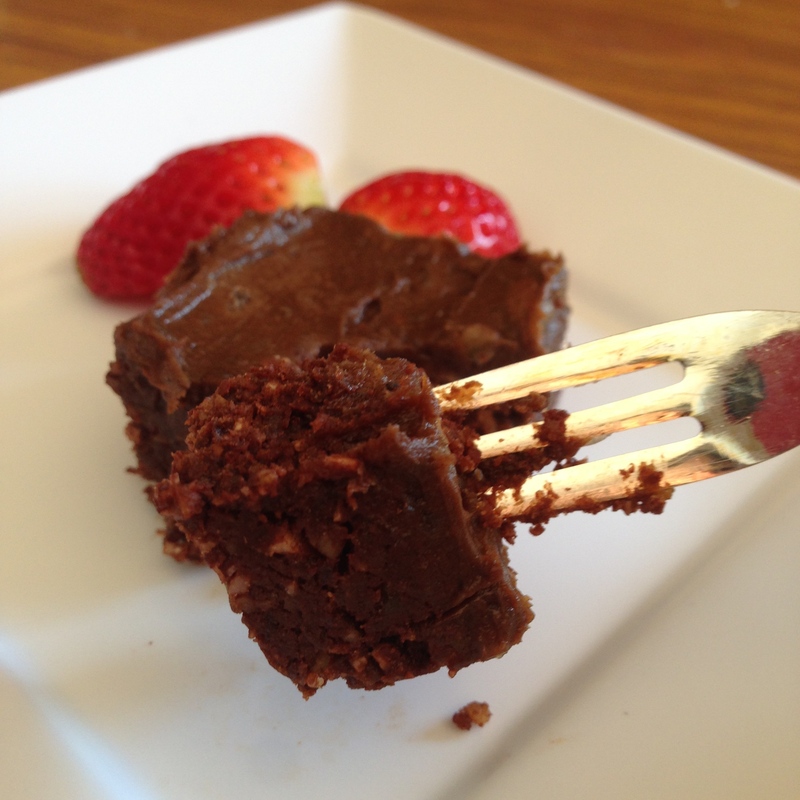 Slice brownies into about 4cm squares. Keep brownies in the fridge until required or freeze for the occasional sweet treat.